I have previously opined on General Motors and it’s reorganization when it discontinued the Pontiac, Oldsmobile, Hummer and Saturn Brands. Plus, I admit to wondering why Buick stayed, when the much sexier Pontiac went by the wayside. I understood why Oldsmobile, which was so similar to Buick was largely a duplication of efforts. Also, I felt that Saturn was a venture into a territory that would be hard to attract buyers because, like it or not, all too many people feel they HAVE to negotiate when buying a vehicle and simply feel they are overpaying if they can’t. Hummer – well, we do have a number of wide roads, but fuel prices were going through the roof and Hummer was a brand that was built to enrich Exxon-Mobil and impoverish the buyers of the vehicles. I had always loved Pontiac, and still admit a warm spot in my heart for the Trans-Ams of yesteryear. Nearly a year ago I test drove a 2018 Buick Enclave Avenir and it made me feel a lot better about Buick. At the beginning of 2019 I was delivered a new 2019 Buick Encore Essence. I found that the Encore Essence was about $20,000 less than the Avenir, with a MSRP sticker price of $33,375. While I fondly remember my experience with the Enclave Avenir, I am sure I would much rather spend $20K less and bring home the Encore. My test Buick was equipped with $3,080 of extra options, the most expensive of which was the safety package. This included rain sensing wipers, an ionizing air filter, front and rear park assist, forward collision alert and a lane departure warning with a $940 price tag. From my point of view, that seems a bit high for this collection of options as does $900 for a power moonroof. The $595 charge for a Bose premium HD radio seemed a little more in line. A turbo 1.4 liter DOHC engine for $250 is an option I would not pass up. Items included in the $29,300 base price are cruise control, power windows, dual zone climate control, power door locks with lockout protection, heated leather appointed seats and a 120 volt power outlet. 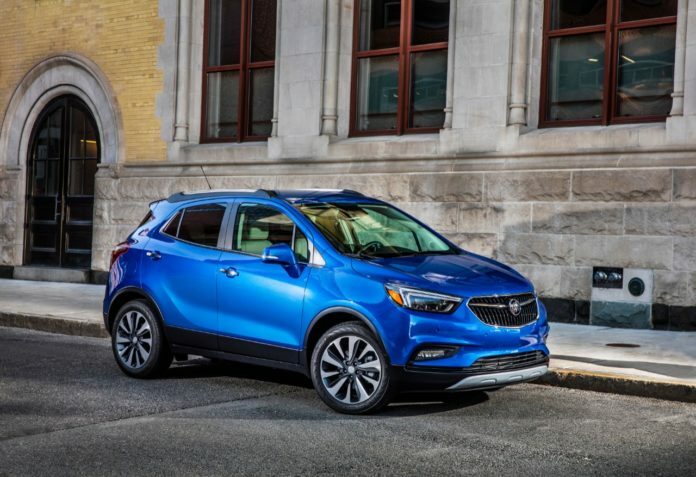 The 2019 Buick Encore Essence is rated at 28 mpg overall (26 in the city and 31 during highway driving). It has a five-star safety rating score for frontal and side crashes and a four-star one in case of a rollover. All in all, I would have to consider it to not fit our family’s needs in that the children complained that they had very little room in the rear seat especially while in their booster seats, and I am sure I have driven other small SUVs in this price range that we all enjoyed more. By all means, consumers should make their own decision and test drive one for themselves at the nearest Buick dealership. Everyone has different needs, and the Encore Essence is certain to fit some other family’s desires and wallet better than it does with us!